To enhance the frictional grip between the bracket and the pipe used for engine oil transmission, and perform structural analysis to measure the additional stress impact on pipe. Hi-Tech’s team of design engineers and FEA analysts came up with an effective solution of developing a new bracket design with the ‘broach’ feature, inserted between the inner surface of the bracket and outer surface of the pipe. The broach provided an additional grip to the pipe, restricting its movement effectively. The new design was also analyzed for structural strength, stress concentration and elastic deformation. Brackets assist in supporting fluid lines spread across the engine bay area under the hood of an automobile. The primary purpose of brackets is to prevent the high pressure fluid lines from moving and remain aligned between the fluid supplying and receiving devices. To provide rigid support, the brackets need to maintain substantial grip on the pipe without generating excessive stresses that may lead to deformation. The client being a leader in auto parts manufacturing, needed one such solution to improve the bracket design for additional gripping ability. The major requirements from the customer were to improve the bracket’s grip on the pipe surface, without promoting excessive elastic deformation. 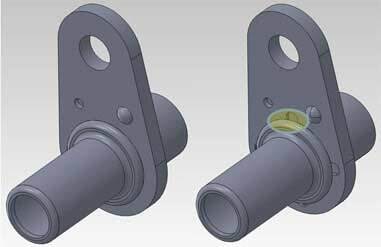 To improve the existing bracket design for better frictional grip, a new design was proposed, which included a broach inserted between the pipe outer surface and the bracket’s inner periphery. Both the new and existing designs were first analyzed for structural strength by applying maximum load to evaluate maximum equivalent stress as well as elastic deformation. The overall contact pressure between the pipe and the bracket was measured to evaluate the gripping ability of the broach. The results showed a significant improvement in the frictional grip in case of the new bracket design with broach feature. A comparative stress analysis showed that with a slight increase equivalent stress, the frictional grip achieved was significant, while maintaining the design safety.